I really like the effort that is being put in to make the gnome shell look good, but could something please, please be done about that glowing effect that you can see here for example in the left bar. In my opinion it’s really not very appealing (in my opinion of course). I do like the look of the new running indicators (a.k.a. as the glow effect), but then this is not any less of a personal opinion than yours. If it really bothers you, your best option is to talk to jimmac and mccann on #gnome-shell, as they are the people behind the shell’s design and visual appearance. How flexible is the design? Is adding an option to change the indicator style easy? No, there won’t be any options to change the style of individual elements. All styling is done with CSS though, so it is not very hard to adjust (e.g. by custom themes). 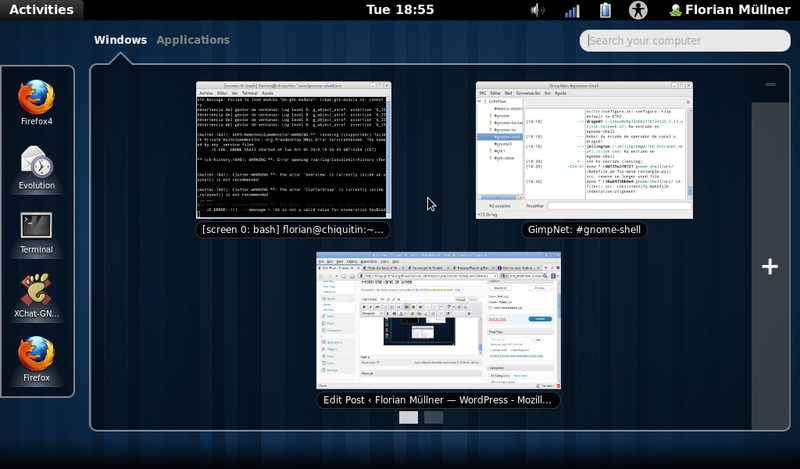 I’m happy to finally see something about gnome-shell on planet gnome! Great work, nice look!!! Keep it up!! I am interested in grid view… could it be used in new design? I’m afraid grid view is not part of the new layout(*), but if you take a look at the drag-and-drop mockups linked from the original posts, you will find quite a bit of grid mode preserved there. Anyway, I’m sure you will cover that “need” somehow. Keep up with the work. It’s great. I’m looking forward to building a the new version (in a few days time). Great! Looks like Unity though. Great. It’s better than the old Gnome-Shell. Looking great! Awesome work so far. And so happy to see you on Planet GNOME. Well, thanks! Having been added to Planet GNOME was quite a surprise actually, as I didn’t manage to request it before having to go on a short trip to Germany this week … guess I need to extend my “people I owe a drink” list then. Pingback: » Dai mockup del GUADEC al codice: quanti sono i progetti basati su GNOME? i think it would be interesting to do it like the Firefox 4.0 Candy Tabs, whith de possibility to group windows in thematic groups. It’s a pitty that i haven’t the skills and time to collaborate on the project . Seriously, I don’t really see the usefulness of such a feature for anyone but a very limited set of “power users”. Those can be catered with an extension while keeping the interface clean for anyone else. After a long time having no interest in Shell, I realized this week that its fluid on-the-fly virtual desktop management was absolutely perfect for me, and wondered why it had never been done before. Fixed physical desktops are awkward to maneuver between, and grouping windows by process name is utterly useless. But it’s already been a month since the one feature I want was dropped entirely? What? Why was this done? I can’t find any discussion or reasoning except for vague unsubstantiated “nobody will use it” reasons. Anyone who says they’d use it is deemed not a representative user. Well, that’s some fine circular reasoning. Who are these mythical users who understand and use virtual desktops but would hate the ability to manage them? Sure, just don’t expect anything exciting – the old panel and window manager will not go away. It looks quite good !!! Keep rocking Florian !!! Hey Florian, the new overlay looks great! I’ve actually gotten a really recent build up.. 4a778 from overview-relayout rebased atop master in the gnome-shell repo.. had a successful rebase and build (always good to see branches that’ll rebase on master easily).. but the performance of the new activities overview is quite poor, I’m sad to say (mostly when hitting the Windows key to bring up the acitivities overview.. it takes a second for everything to get into place and be ready for input). I’m not running a terribly “new” system, per-se, but it’s not bad either.. a pretty good single core proc (amd fx-55), 4gigs of RAM and a GeForce 7800 GT on ubuntu 10.10 32bit.. but still the perf on the new overview-relayout branch is bad enough that I’m gonna go back to HEAD on master. I don’t want to diss on your work as I’m really excited to see it succeed and know that there’s a reason it’s still not on it’s own branch and not in master, just curious if perf is a major concern relative to other feature/polish work that is going into the activities overview. of course performance is going to be a major concern if gnome 3 didn’t perform better than gnome 2 who would care. It’s in so much development right now it’s not even funny. What kind of a question is that, and hey, just relax the guy is coding gnome 3 he’s implimenting the mock ups give him a break. Check back when something gets released.